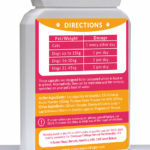 60 Simple ‘Sprinkle’ Capsules Did you know 80% of your dogs immunity is generated in its gut ? 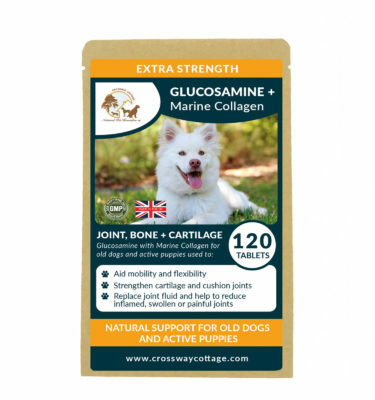 These tablets are meant to be eaten directly, or as part of a meal, and easily crushed if necessary into your dog’s food or a treat. Dose can be given based on approximately one tablet per 10 – 125kg of weight. 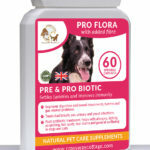 How Do I Know If My Pet Needs a Probiotic Supplement? The health of an animal’s GI tract can be easily compromised by everything from emotional stress to unhealthy lifestyle choices they have no control over. Over 80% of your pets immune system is generated in the gut. 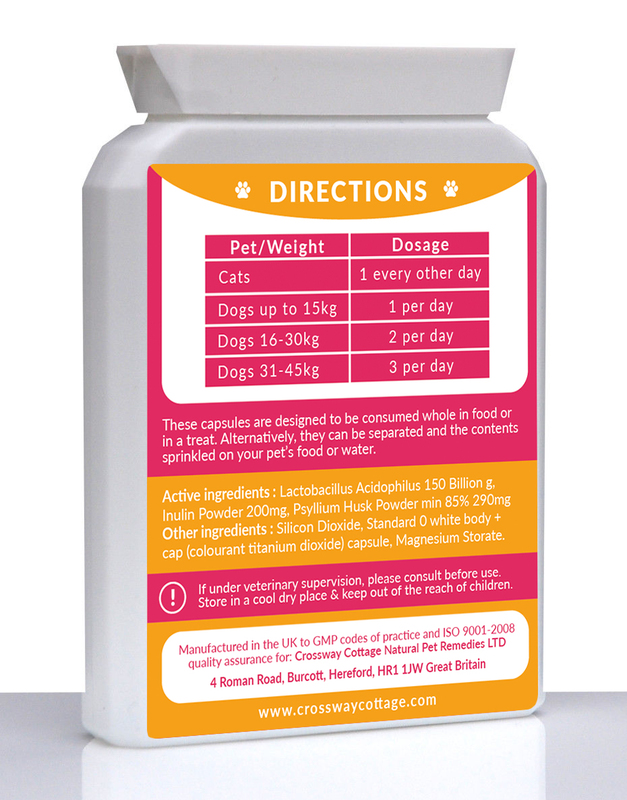 An imbalance of bad bacterium over good has a detrimental effect on many areas of your pets’ health. As an example, veterinary antibiotics and corticosteroids are overprescribed, and both types of drugs can decimate the helpful bacteria in your pet’s gut. Other stressors that can open the door for pathogenic bacteria to overwhelm the good bugs include a sudden change in diet for a pet that’s been eating the same food every day for months or years; a poor quality, biologically inappropriate diet; eating non-food items like poop, grass or rocks; drinking unclean water; ingestion of toxins; vaccinations; boarding; travel; GI disease and surgery. When GI stressors throw the balance of good-to-bad gut bacteria out of whack, it can create a cascade of nutritional and other health problems. It also opens the door to leaky gut syndrome (dysbiosis), which means your dog or cat is absorbing partially digested amino acids and allergens into the bloodstream. This can trigger a wide range of additional health problems, from allergies to autoimmune disease. Many of us think of bacteria as harmful, or even deadly, but did you know that certain bacteria are not only desirable, but necessary for your pet’s good health? “Friendly” bacteria such as Lactobacillus acidophilus Lactobacillus this helpful microorganisms that can reside in your dog or cat’s intestinal tract where they play an important role in defending his body against disease and illness. These kinds of bacteria are referred to as “friendly” because, rather than causing illness and disease, they serve to defend your pet from harmful organisms, which can invade his body from time to time. · Skin problems including Alleviating the occurrence or symptoms of atopic dermatitis. One of the most common ways that the ratio of friendly-to-harmful bacteria gets nudged out of balance is through the use of antibiotics. Of course, the use of these drugs is not always avoidable, especially if your dog or cat is fighting a serious infection. Unfortunately, antibiotics are not able to distinguish between friendly and harmful bacteria, so when eradicating the harmful bacteria (the source of many serious infections), they also kill off a large number of friendly bacteria. This leaves your pet with even less of a defence the next time he is exposed to harmful microorganisms. Chemicals in the water supply and soil can have much the same effect. They do eliminate many of the harmful bacteria your pet is exposed to; but they also upset the balance between good and harmful bacteria. In this way, chemicals can also have a negative impact on your pet’s health. 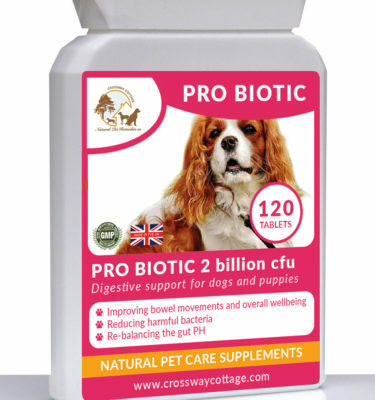 One of the simplest and most effective remedies for poor digestion is to administer probiotics to your pet. Probiotics are supplements comprised of different kinds of friendly bacteria. The ingredients in them may vary from brand to brand, as do the methods of delivery. For instance, probiotics may come in capsule, paste, liquid, or tablet form. 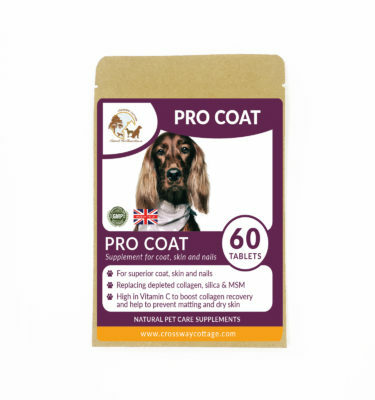 They may even be included in some brands of commercial pet food, although this is not considered the best source since, according to some studies, certain brands do not contain the amount or even the kind of probiotics that are stated on the labels. For this reason, supplements are considered the more effective way to go. Prebiotics are the nutrients that act as the energy source or food for the “good” bacteria that live in the intestinal tract. They help the beneficial bacteria thrive. Prebiotics are a specialised form of fibre. We all understand that fibre is a necessary part of a healthy diet for humans and helps regulate our bowls – the same is true of our pets. 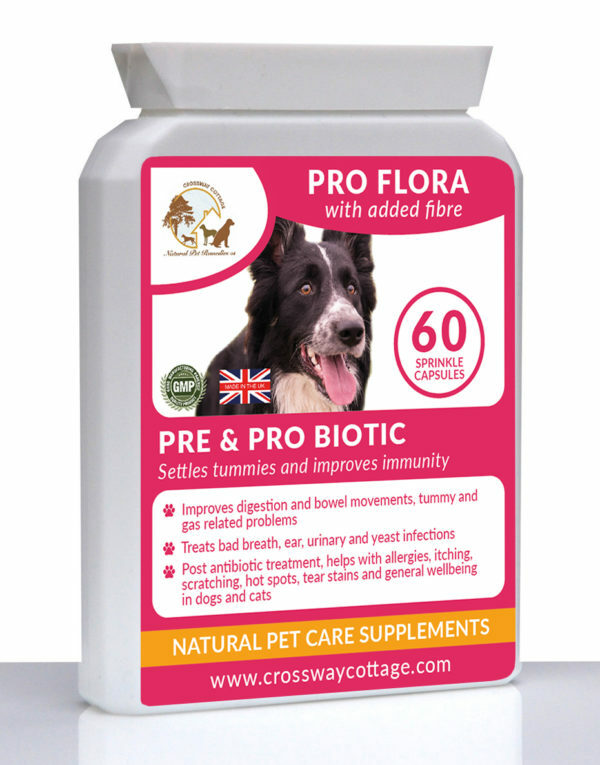 ProFlora Probiotic has added fibre to help maintain regular and healthy bowls. 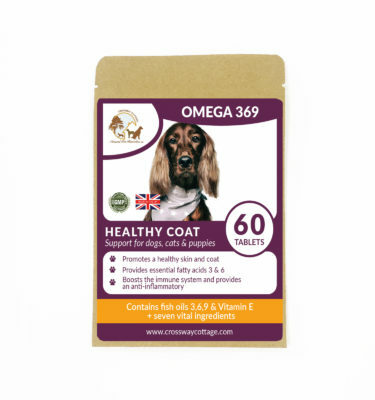 Very happy with this product my cocker spaniel Buddy had bad tummy upsets while introducing raw diet but this tab cured him in a very short time. He is now looking so much better.